Whether if it's to swim with your friends, participate in a swim meet, or even because swimming makes you feel like a shark, SafeSplash wants to know why you swim! 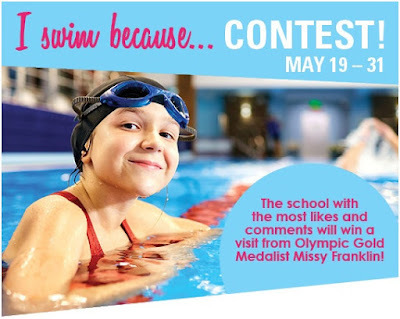 Post a picture or video to your local school's Facebook page telling us why you swim and the school with the most likes and comments will win a visit from Olympic Gold Medalist, Missy Franklin! Have you ever played Sharks and Minnows with an Olympic Swimmer? Now is your chance!